Natalia Lafourcade is a Mexican pop/rock singer and songwriter from Coatepec. While growing up, she performed in a mariachi band and in an all-girl trio called Twist before going solo at age seventeen. Her self-titled debut album was released in 2002, garnering her a GRAMMY nomination for Best Latin Pop Album. Three years later, she released her followup, Casa, as Natalia y La Forquetina, which was the name of her band at the time. In 2006, she announced she would be leaving the band to perform as a solo artist once again. Lafourcade continued to release solo albums, with her 2009 release, Hu Hu Hu, becoming a Top 10 album in Mexico and receiving nominations for Best Latin Pop Album at the GRAMMYs and Best Female Pop Vocal Album at the Latin GRAMMY Awards. Her 2015 release, Hasta La Rai­z, and its single of the same name have been nominated for five awards at this year's Latin GRAMMYs. Watch her perform live on the awards show, held at the MGM Grand Arena in Las Vegas, Thursday, November 19th. Get to know Lafourcade a little deeper as she shares many of the albums that influenced her during a recent chat with our "What's In My Bag?" crew at Amoeba Hollywood. She starts with Joni Mitchell's classic Blue, the biggest musical inspiration for her current album. She also talks about Erykah Badu's seminal Mama's Gun, Edith Piaf's Je Ne Regrette Rien, and delves into the catalog of Nick Drake. Courtney Barnett is an Australian singer-songwriter known for her witty, rambling lyrics and deadpan singing style. After playing with garage/grunge band Rapid Transit and psych/country band Immigrant Union, Barnett founded the label Milk! Records and released her first solo EP, I've Got a Friend called Emily Ferris, in 2012. Her next EP, 2013's How to Carve a Rose into a Carrot, won praise around the world. That year she performed at CMJ and played several European dates, eventually releasing both EPs together as The Double EP: A Sea of Split Peas. In March 2015, Barnett released her debut full-length, Sometimes I Sit and Think, and Sometimes I Just Sit. To promote the album, she performed at SXSW before heading out on a lengthy, globe-spanning tour. Universally critically-acclaimed, the album reached the #4 position on the Australian Albums chart and #20 on the Billboard 200 in the US. Just this month, Barnett was nominated for four Australian Independent Music Awards, including Best Independent Artist and Best Independent Album. 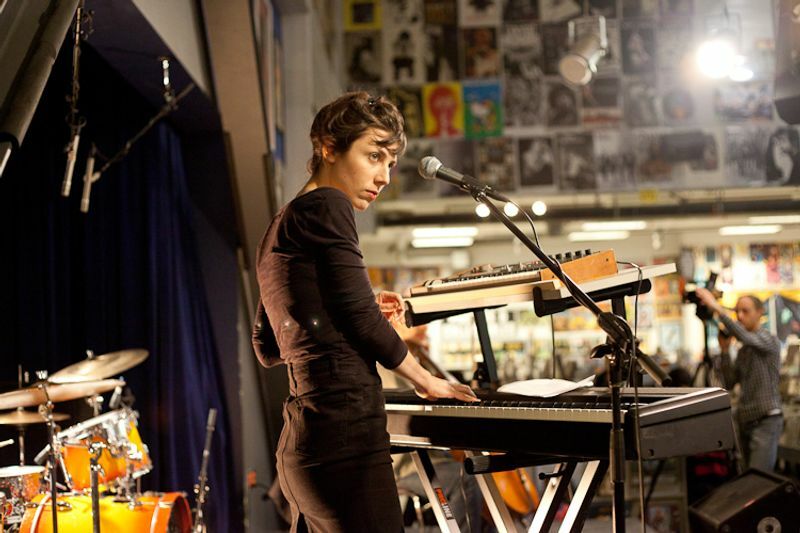 I interviewed performer Julia Holter a while back, last year when she played at Amoeba Hollywood upon the release of her album, Ekstasis. Now the CalArts-bred experimental pop artist is back with a new album, Loud City Song (available on CD or LP), and it’s one of the year’s best, combining cerebral electro-pop and neo-classical orchestration, with a piano-based, singer-songwriter heart. Read our conversation below about Joni Mitchell, TLC and the vastness of L.A. Make sure to check out Loud City Song and see photos from her performance here. Me: Were you always able to sing growing up, and who were some of your singing idols? Holter: I didn’t sing much until I was—well I sang in secret—and when I was like 15, I started listening to Joni Mitchell a lot, like her later stuff that’s really cool, not just the early, folk stuff, but the weirder stuff. Me: Like her jazz records?